I saw a galloping wild coyote. I was on the way to the county waste plant to dump a load of garbage. I driving down County Services Road (or County Farm Road) and a big coyote ran across the road right in front of me. No, I didn’t hear a “beep beep” or see the Road Runner run in front of me first. 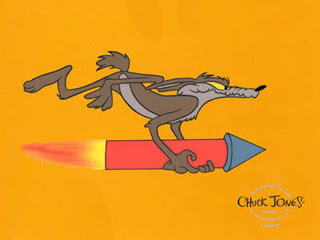 However, the coyote might have had on the Acme Rocket-Man kit – I think his feet hit the pavement only once going across, but he was too fast to see his feet movements. Coyotes are rare in this area. But there are some. From time to time I read in the local paper that coyotes have been attacking small pets and one time even cattle. A lady that I sometimes walk Willow with when she walks her dog told me she has seen coyotes in the woods behind her house. One time she saw a sign on a telephone pole saying that a pet cat named Fluffy was missing. She called the number on the sign and told the family that Fluffy was probably eaten by coyotes. I bet the family members were waiting for a little more pleasant news than that about Fluffy. The big coyote I saw yesterday was running free and happy was about 200 to 300 feet from the Cobb County Animal Control Center. The building you dump your garbage at is a huge building the size of an auditorium. Heavy bulldozer type of machines are always pushing the garbage around into smaller compact groups as you dump it. Yesterday there were two prisoners that were suppose to guide the people with garbage to the next opening. One was dutifully doing his job and other found a magazine in the trash that was more interesting. After unloading my load and I was getting back into the truck a little white car was directed in the place next to mine. The car skillfully backed up and a little old white-hair lady that looked about 80 stepped out and was putting on her work gloves as I drove off. I don’t know if it is still there, but there was at one time out front of the building a whole car, compacted into a little cube no bigger than a a trunk. I drove out into the road the opposite way than the way I came in. Up about a block’s length was the old County Farm Inmate House where Cobb County prisoners or convicts were kept. It is no longer a place to confine prisoners. A new one was built several years ago that you can see off in the distance. It looks much bigger and probably nicer. But the old brick house is still there and out front the old watch tower still stands as a reminder of how things used to be. Every time I pass this corner where the watch tower stands I remember one time when I carried a load of junk to the dump and on my way out, at this corner there used to be a stop sign and I always stopped (this area is always loaded with law enforcers). That time, I noticed across the drive, just across from the barred windows of the brick building, were a couple of Bell South vans. 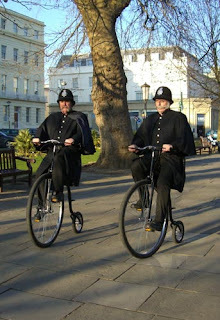 Then I noticed two of the helmeted men sitting on a small grassy bank in the shade of a big oak tree and a female helmeted Bell South worker had her helmet tilted and she was unbuttoning her shirt. She was facing them and also the brick inmate house. I think she was going to flash the inmates on a dare of her co-workers. There was a car behind me so I had to move on. Snap! Back to present: It was pouring down raining yesterday as I drove north on Powder Springs Road. When I got close to the Clotfelter’s swan the traffic was crawling. It was very slow. As I got closer to Sandtown Road I saw the reason. A yellow-van taxi and a pickup truck had a smashup. Police and ambulance emergency lights were flashing like crazy. A couple of stretchers were out in the rain. As I rode by I studied the wreck as much as I could while the rain was pounding down. I was almost at the traffic light when it turned yellow… I stepped on the gas to shoot through the light – but before I made it under it turned red. I looked in my rearview mirror to see if any of the law enforcers at the wreck saw what I did… I didn’t have to look that far back. Right behind me was a Cobb County Police Car who stopped for the light. I was surprised he didn’t get in hot pursuit after me. He didn’t. He just sat there. The only thing I can figure out why was because I was in the city limits of Marietta and therefore under the jurisdiction of the Marietta Police, not the Cobb County Police, who let me slide. Thank the Lord for the “That’s Not My Job Policy”! Neat story. Can picture the whole thing. Did the push-the-yellow-light thing a year or so ago in Washington. A week later I got a picture of myself doing it along with a letter saying pay up $75 or go directly to jail. They are taking all the fun out of life. My wife got a candid shot of her driving under the yellow/red light too. It cost us about $75 or $80. That was about a year ago. More recently, about a month ago, I went under one changing, and it made it to red before I completely got under it... there are only two in Marietta that have cameras. It was one of those I ran. The bad thing is that I was driving my mother-in-law's car. She is in physical rehab in a nursing home, so I am getting her mail everyday - and am on the lookout for that ticket.